Business Insider’s Kate Taylor agrees, at least when it comes to Trump’s penchant for regurgitating other people’s advice. “The book reads like a mashup of countless essays and articles written in the past decade aimed at female entrepreneurs. That isn’t to say all the advice is bad, it’s just that little is new. 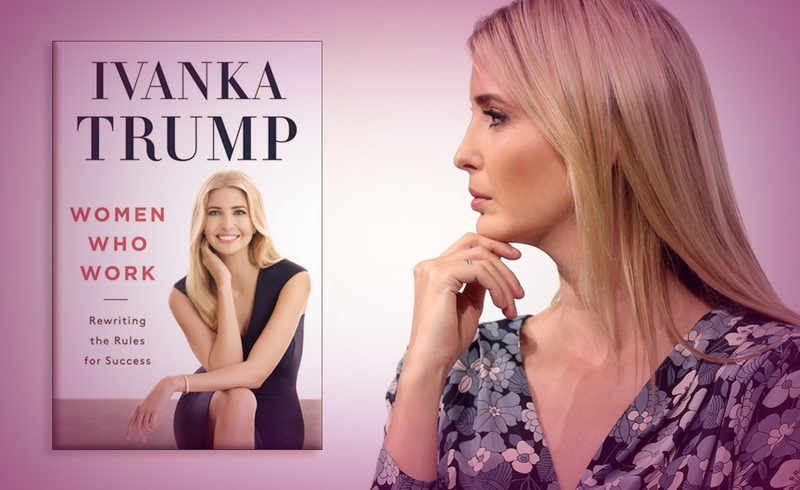 The book borrows heavily from books like Sheryl Sandberg’s “Lean In,” Joanna Barsh and Susie Cranston’s “How Remarkable Women Lead,” and backlogs of IvankaTrump.com. Her worldview it turns out, is not so different from her father’s. Both see society through the lens of quasi-mystical corporate self-help, the sort pioneered by Norman Vincent Peale, author of The Power of Positive Thinking and a major influence on Donald Trump. In their scheme of life, success is proof of virtue and people are to blame for their own misfortune. If Ivanka Trump hasn’t expressed any outrage at the cruelties her father is inflicting on the poor and vulnerable, it may well be because she doesn’t feel any. HuffPost’s own Emily Peck similarly remarked upon the First Daughter’s inability to “realize just how much being wealthy, white and famous helped her out in life.” Ivanka’s life seems pretty smooth but in her book, she reveals struggles, like the time Anna Wintour heard that she was about to graduate from college and called out of the blue with a job offer, a challenge familiar to so many aspiring writers. Lol! Book world ire is hardly new for Ivanka Trump. Just last month, a horde of social media-savvy librarians schooled the author after her tone-deaf #NationalLibraryWeek tweet applauding libraries when her father had just proposed a budget cut of $230M to cultural agencies which $213M of that go to library grants. Will Ivanka Trump’s Book Change How People View Her? Actually yes. The book I feel is a much more personal insight of who she really is than she knows and people will see that! Whether it be negative or positive, she has exposed an underbelly of her entitled views on working women. This card represents a difficult life situation. I feel this card shows Ivanka is not having a fun time being a target of criticism for her failures. This card represents forgiveness and also nostalgia for the past. I believe this card shows she has a tough time “forgiving” her attackers and just might be wishing she had her old life back. This card represents manifesting what you want but since it is inverted, it also shows tricks and illusions. I feel Ivanka feels her position was offered in a “smoke and mirrors” illusion. Nothing is turning out the way it was promised her.